So what did you do last night? I'd like to say that my Sweetie and I were on an all-expense paid trip to NYC, where I went to the gym with Marq1, joined Mar, Joe, Lars, Carol and the gang for a yarn crawl, and ate at some wonderful restaurants. Except, I wasn't there. Following the success of the Orange Project * I decided to try the same dyeing strategy with different colours, choosing Jacquard Sky Blue 621 and Teal 631 dyes. I fished 200 grams of wool top from my stash. The bag was not labelled (I was relying on my memory): I think it's Falkland top, perhaps originating from Dunnose Head Farm; I bought it at Romni Wools in Toronto. As you can see from the photo, the dye struck very irregularly. I dunno why: maybe the fibre had some processing oil in it that repelled the dye? Initially I was unhappy with this, but I think that it will make a beautiful yarn: more complex than what I was originally planning, since in addition to the shifts in hue (i.e. teal, blue) there will also be shifts in value (pale or dark / deep colours). At least it will be interesting to look at. If it barks I can compost it, right? 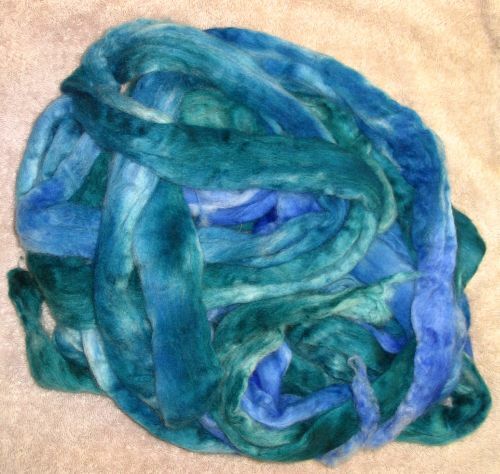 The one thing I'm curious about is how the professional dyers who do rovings and tops keep the dyed fibres nice and lofty and fluffy. Mine get compacted. Is there something obvious about doing this that I'm missing, or is it a super-special trade secret? * Looking at the picture comparing my orange yarn with the 2 commercially-spun merino laceweights I can see how irregular the commercial stuff is, which has me feeling a lot better about the merino I recently posted about. Further to that, does anyone use GIMPShop? Comments? On the 18th of December, I found a local store that sold lights used for treating SAD; they had just received 10 that morning. I took the promotional literature to do some comparison shopping, and returned on the 20th to get one. All sold out. In fact, all 10 had been sold in less than 24 hours and they weren't expecting more til the middle of January. I was gobsmacked. On the 28th they called to say they'd found some through a different distributor. So, I have a Day-light. It's not the most elegant looking thing (but an exercise bike in the living room wouldn't be elegant either), and 10k lux is quite a jolt at 7am. It's still early to say if it's helping, but I hear repeatedly that it takes several days for users to notice a difference. Our fingers are crossed. Many thanks to (blogless) Jim for assisting with the comparison shopping: I likely wouldn't have gotten it without your encouragement. So that's it for today. There's a stew in the slow cooker (I had a part bottle of wine carrying the charming label of "Goats Do Roam") and it's time to make dumplings. I hope you each get your heart's desire in 2007, and send best wishes for peace, joy, health, and prosperity. Can I cheer you on? I joined a new gym close to my house, and although the last week has been difficult, with the kids off school and the holidays, I've been trying to do Nautilus a couple times a week. My joint issues are leftover from the Lyme and since that seems to be diminishing, it's mostly a matter of trying to get back into some semblance of shape. Hope the light helps, and that you, too, have a wonderful, healthy, productive, joyous year. Re compacting - just do a little drafting, and it'll fluff back up. Trust me. Happy new year, Ted. Best wishes for 2007. I absolutely love what you dyed. The colors are marvelous! I wish you had been in NYC because we certainly would have gone on a yarn crawl! You would have enjoyed Seaport Yarn, where Carol and I went on Thursday. I'm back to the diet and the treadmill. Oy, those Christmas cookies! Happy 2007, Ted! What kind of dumplings did you make? Ted writes: Plain ole baking powder dumplings. 2 cups flour, 4 tsp baking powder, a dab of salt. Cut in 2 tablespoons of shortening or marg or butter, stir in about 2/3 cup milk and mix til *just* combined. Drop by spoonfuls on the top of the stew to steam. It's better if they don't sit in the liquid or they get soggy: it's about steaming them. They're a bit flat in flavour, so benefit from the addition of a slug of rosemary, sage, thyme -- what have you. I was wondering the same thing about the roving. And, if you want, we could do a swap. I'd send you some of mine and you could send me some of your blue and teal! There's a bunch of them, but I like the blog format of this one. This site is good in and of itself, but don't miss their "Don't Miss" page--full of links for all sorts of great sites for digital cameras, reviews, tips, and so on. I love the fact that you know me so well that you would be going to the gym with MarQ1 and not me if you came to New York. I would love to go, but just don't have the time during student teaching. We have been working on our diet and I am down to 235, so I still may be able to fit into my chaps by the time Pride Day comes around. I can vouch for yoga, too. I am a less-than-svelte 50-cough year old with osteo arthritis and crappy hip joints who has been doing Ashtanga yoga for 9 years (don't look so impressed, I only do it once a week with a lunch-time workplace class, that's not enough as-any-expert-will-attest.) You might call Santosha Yoga in Ottawa and see if they would recommend a place/teacher down your way; they should know who's around. I can bend right over and dig dandelions for hours, so it must be working, and my rheumatologist always seems impressed with my flexibility. And the breathing sure helps me get through dental appointments! A good yoga teacher will encourage you to only go as far into a posture as your body can handle that day, and to help you find accomodations for postures which your body doesn't like. All that without judgement of your ability or commitment. So that's my essay for today, except to say that if you think that fibre might bark, I have a compost heap. The wool wouldn't go near it, though, just directly to my wheel. Yum. I've also spent New Year's Eve alone, and it was ok, but now I wish I could have been there with you learning how to do such gorgeous dyeing! I really love what you did with that top and I can't wait to see the yarn it will become. Best wishes to you too for the coming year! That dye job looks great. I think you need to work on your perfectionism :-) I suspect if you don't like it someone else will. If you can find a yoga teacher that teaches Iyengar yoga it will be good. The two teachers that I have had of this style really stressed protecting the knees and body alignment as opposed to how far in a pose you can take. My one teacher said Iyengar teachers do not want to be photographed in a pose since they always feel their alignment is not what it should be. Iyengar yoga also uses props to help get into the proper position. When I have gone to random classes I end up not doing a bunch of the poses since I realize what they are telling me is not good for my knees. I'm looking forward to seeing what yarn you produce from the fleece. It may look funky now but I think that with careful blending it will come out very nicely. Good luck with the light. Every little bit helps. I'm telling you, Ted: the pathway between you and the compost pile is blocked by a very small and resourceful wool fiend who knows your weak spot. No, not that weak spot. Can I come visit and get you to teach me how to dye? That's gonna be kickass yarn! I can't wait to see it all spun and knit! When you join the 365 photos, just enjoy yourself! Bet at the end, you'll be a master photographer. I bite when it comes to picks (and you certainly do not), but I'm better now than 6 months ago. I guess it's ALL just a big learning process. Enjoy those dumplings (droool) A very Happy New Year!!! You don't know me, and I don't have a blog, but I read your blog all the time and enjoy it. And I wanted to chime in on the topic of yoga. It really does help your joints, if you get the right teacher. I've had great luck with Iyengar yoga too, but the best yoga teachers I've had have been trained at Kripalu in Massachusetts (www.kripalu.org). There are Kripalu-trained teachers all over the place; I bet there are Kripalu teachers near you. Kripalu is a gentle form of yoga that is about paying attention to your body as you move into and out of the poses. Please don't ever stop blogging; your blog is interesting whether or not it's instructional, because you're thoughtful and you write well. My two cents, anyway. Good luck with yoga! And that top is gorgeous. Chiming back in to echo what Beth said -- every Kripalu teacher I've had has been wonderful. I had the great privilege to attend a weekend session there *many* years ago, and would give my eye teeth to go back. When I fell last winter, the first attempt I made at doing anything was a yoga for back injuries workshop with a Kripalu-trained leader. Best thing I could have done. Just dropping in to say that I have a spindle, some roving and Interweave's Spin It - and I hope to start learning tomorrow (I've already read the booklet as well as some Internet instructions). I think I'm going to love this and then I'll want a wheel, and I'll be in trouble. But I wanted to thank you again for your suggestions, encouragement and links! You are so generous. Best wishes to you in this still new year - and if you keep dyeing things like that I am going to want to try that, too! Hey, you going to take an "after" photo -- I'm assuming you got some of that 20cm that fell further north? Love your blog, BTW. Feel free to come and leave strange messages on mine!